Powers/Abilities: Värcolac was a powerful demon with many undefined powers including shapeshifting, undefined superhuman speed, strength and agility. His actual semi-humanoid wolf form possessed standard wolf features including fangs though his clawed paws seemed more bear-like. He possessed longevity (he was millions if not billions years old) and a psychic connection to all beings inflicted with lycanthropy. Werewolves under Värcolac's influence tend to act murderous and feral. Värcolac was omniscient within his realm and could form a physical body from the souls of the werewolves that had been trapped there. Illustrations showed him with wings, though it is unrevealed if he ever actually possessed any. If he did possess wings at some point they possibly enabled him to fly. The Wolfsblade, the "Magic Bullet" and the "Wolfseye" is a three-piece puzzle apparently created by Värcolac, which could enable its wielder to overthrow or control the demon. (Marvel Tarot (fb) - BTS) - Chthon conducted a series of mystic-genetic experiments on early humans by twisting together the tissues of man, beast, and demon to create several elder races to serve him, including the Wolf Lords. For some time his Wolf Lords held all the world in terror. Vârcolac, the Wolf Demon, was the most feared of the Wolf Lords. He was a relentless, merciless hunter, whose speed no prey could escape from. He eventually impregnated Echidna, who gave birth to their daughter Angerboda, who then mothered Fenris Wolf and the Midgard Serpent (Jormungand). (Official Handbook of the Marvel Universe A to Z HC#13 - Werewolves/Doctor Strange: Sorcerer Supreme#26/2-27/2 (fb) - BTS) - The Caretakers, three colonizers from the star-sun Arcturus, based in the Savage Land created the modern incarnation of werewolves by combining advanced genetic re-engineering science with magic derived from Vârcolac. They bound the spirit and DNA of the captured wolf Windracer to a humanoid, which resulted in the hybrid named Greysire, who spread lycanthropy to humanity via scratches and bites, and then by heredity. The resultant race was known as brethren by wolves and as werewolves by humanity. (Official Handbook of the Marvel Universe A to Z HC#13 - Werewolves/Marvel Comics Presents I#55/2 - BTS) - Initially peaceful, werewolves became more violent as man fell out of harmony with his primal self and as Vârcolac sometimes influenced their wolf forms. Feral werewolves soon darkened their reputation, making them enemies of humankind. Though widely regarded as a product of myth and superstition, werewolves have dwelt among normal humans for centuries, usually indistinguishable except on nights of the full moon. (Werewolf by Night II#1 (fb) - BTS) - Acting from the shadows the secretive Vârcolac's name was forgotten. Remaining a nameless creature of legend for millennia. (Werewolf by Night II#1 (fb) - BTS) - During the Middle Ages the wolf-worshipping Cult of the Third Moon chanced upon Vârcolac's Wolfblade. They tried to use it to control the demon, but instead became indebted to him because the blade was just a fragment of what was needed to control Vârcolac. (Werewolf by Night II#4 (fb) ) - Centuries ago Värcolac placed its biggest secret, the last piece of the puzzle needed to overthrow him, in an artful wooden box in his realm and placed it on a stone pedestal. Many have accepted the challenge to attain it, but despite countless incursion over the years to his domain all failed to get their hands on the last piece and got trapped in his realm. Vârcolac tormented the souls of all deceased werewolves that got trapped in his realm for centuries. 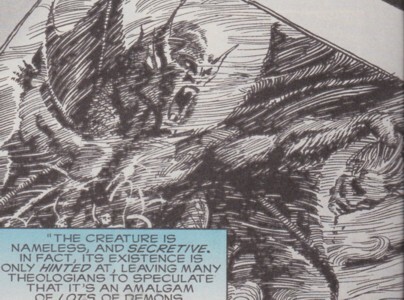 (Werewolf by Night II#1 (fb) - BTS) - Throughout existing literature references were made to a demon controlling the wolf aspect in humanity, but his existence was only hinted at and many theologians speculated that the demon was merely an amalgam of lots of other demons. During the 1930s Walter Clarke purchased the Wolfsblade and became the Cult of the Third Moon's new leader continuing the human sacrifices for Vârcolac. (Werewolf by Night I#3 (fb)/Official Handbook of the Marvel Universe Deluxe Edition#14: Werewolf / Dr. Strange III#27/2 - BTS) - Reading of the origins of lycanthropy in the Darkhold under the light of the full moon unleashed a long-hidden demon that had lain dormant in his ancestors' veins since the 18th century. Gregory transformed into a werewolf, and transferred the curse to his descendents as well. (Marvel Spotlight I#2 (fb) - BTS) - Fallen under the demon's control like so many other werewolves before him Gregory became a feral werewolf and killed a local carpenter. (Marvel Comics Presents I#54 - BTS) - Jack kept fighting with the werewolf aspect of himself during transformations. (Marvel Comics Presents I#55 - BTS) - Gregory Russoff's spirit told Jack that he was going to die if he could not end the war between his wolf and human spirit. (Official Handbook of the Marvel Universe A to Z HC#13 - Werewolves) - The Cult of the Third Moon somehow began to damage Jack's inner peace. (Werewolf by Night II#2 (fb) ) - Jack glimpsed the demon and his Hell during transformations into Werewolf realizing the demon was in control of him while in werewolf form. (Werewolf by Night II#1 (fb) - BTS) - Jack created a cage in the sewer system where he hid away during transformations because he was not in control anymore over his werewolf form. 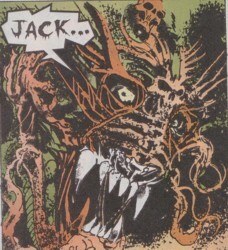 (Werewolf by Night II#1) - While Jack transformed he glimpsed a portion of Hell ruled by Vârcolac, who called Jack by name. Jack wasn't thrilled and told the demon to leave him alone. Fully transformed the Werewolf was out of control, but locked in a cage Jack had built for himself in the sewer system. 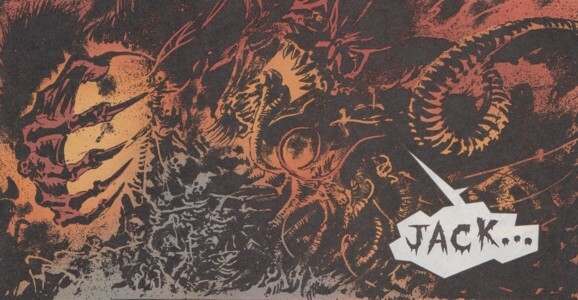 (Werewolf by Night II#2) - Another transformation at the doorstep of the Cult of the Third Moon gave Jack another glimpse at Vârcolac's domain and once again the demon called Jack by his name. (Werewolf by Night II#2 - BTS) - The Cult of the Third Moon sacrificed a man to Värcolac using the Wolfsblade. When Jack as the Werewolf attacked them cult leader Clarke told him that the Wolfsblade was the first part of a three-piece puzzle needed to overthrow the demon. Smedley led Jack Russell at a funfair to a Ghost Train ride, which led to the missing two pieces of the puzzle and to Värcolac's domain. (Werewolf by Night II#3 - BTS) - After escaping a delusion he had to go through during the Ghost Train ride Jack took the second piece from the Ghost Train car and headed further down to Värcolac's domain. (Werewolf by Night II#4 - BTS) - Entering Vârcolac's Hell Jack encountered a werewolf soul stuck in tree welcoming him to this domain where it was easier to transform into a werewolf than on Earth. The werewolf soul suggested to Jack to use his arrogance on the Beast, the master of the this domain, who probably already knew about Jack's arrival. (Werewolf by Night II#4) - Sensing a murmur among the trapped werewolf souls and listening to the whispers of half-truths and accusations Vârcolac learned of the arrival of Jack Russell in his domain. Shapeshifting into the form of a young boy Vârcolac confronted Jack, who had just discovered that only the blade of the Wolfsblade was part of the puzzle. Holding the wooden box in his hands Vârcolac complimented Jack for finding the demon's other toys and offered him the last piece of the puzzle, which Jack could take from the box if he cared enough. Because Jack didn't care the demon formed a gigantic body comprised of werewolf souls and attacked him for his arrogance. During the fight Vârcolac revealed that Jack's presence in Hell did nothing more than confirm his damnation. Vârcolac revealed that many of Jack's bloodline were already trapped in his heart including Jack's father. When counting on Jack's hatred for his father to drive him mad failed Vârcolac instead offered Jack another position in his Hell if Jack ever presented his child to Vârcolac. Jack took a piece of wood and hurled it at the wooden box. It hit the box, which opened upon hitting the ground and Jack took the last piece of the puzzle and then accepted his frailties as a werewolf. Vârcolac warned Jack that he would never truly understand the curse and that he would not be able to go against the rules of the pack because wolves never ran alone. He then attacked the fearless Jack Russell once more, telling Jack that he would never be able to avoid damnation. Vârcolac hit through Jack Russell, who was bathed in a bliding light. For a moment the tormented werewolf souls were satisfied, but then Vârcolac appeared and though wounded he seemed to have defeated Jack by absorbing him. A moment later Jack and the three puzzle pieces exploded from the demon's form, apparently destroying him. Jack then absorbed the puzzle pieces into his body and embraced the werewolf curse once and for all. Moments later he found himself once again returned to Earth in the Ghost Train ride and told his girlfriend Roxanna that he had gotten a tattoo when she asked him where he had been the last hour. (Werewolf by Night II#6 - BTS) - Jack met with Ghost Rider (Noble Kale), ruler of Hell, at the Underworld club. Noble congratulated Jack for his recent improvements and commented that the wolf demon's downfall had been long overdue. Vârcolac's warnings became reality when Jack was overrun by the souls of wolves during his transformation into the Werewolf and lost control over his werewolf form once again. (Strange Tales IV#1/2 - BTS) - Smedley told Jack that even though he was freed from the wolf demon Jack wasn't careful enough when he did get rid of the demon. Comments: Created by Paul Jenkins (writer) & Leonardo Manco (artist). Cancellation be damned! Vârcolac is dead, but Jack's adventures continued with him heroic and in complete control of his lycanthropic curse. How? Maybe it just took him some time to understand the whole situation properly or he received help from Smedley and his allies (possibly the Cult of the Third Moon). He got better and the Wolf Demon was still dead! The complete puzzle seen on the right was what should've given Jack control over his werewolf form and possibly all other werewolves. Now it is just a forgotten tidbit from the late 90s. Or Jack has gotten rid of the tattoo (erm puzzle) and due to the absence of Vârcolac has his werewolf persona still under control even without it because nobody is trying to turn him feral anymore. You see a werewolf running around in the Marvel Universe and he/she is out of control the werewolf was possibly influenced by Vârcolac, so he maybe had a few hundred additional BTS appearances and many of them I am not even aware of because they were during the Atlas or even Timely era. The earliest of these possible BTS appearances was Marvel Mystery Comics I#14/5 (December, 1940), wherein we meet not only newly transformed werewolf Gordon Sanders, but also his wife Llhupa, who was part of a community of werewolves in Tibet. 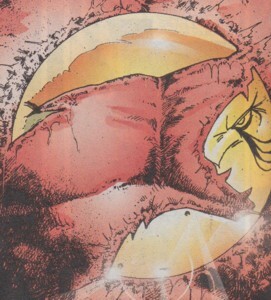 While the latter seemed to be in peace with her wolf aspect the former (Gordon) lost control, which makes him possibly the earliest case in a Marvel Comic of a werewolf fallen under the Wolf Demon's influence. Many others followed including the most popular among them (he had a 43 issues series during the 70s) and the one that finally ended the Wolf Demon: Jack Russell. The desecendants of the Wolf-Men spawned by Vârcolac appeared in Kull stories. See their own profile. They were first connected to Chthon and his spawn in Marvel Tarot (2007). 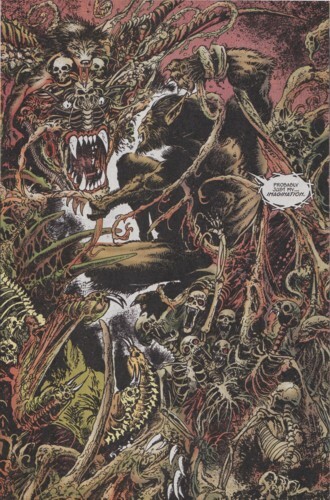 The Werewolves entry in HC#13 made it clear that they were spawn of the Wolf Lord Vârcolac himself. Werewolf by Night I#3 has this bit inside: "For, the reading of that evil book unleashed a long-hidden demon...a demon which had lain dormant in your ancestors' veins for nigh on eighteen centuries...needing only a catalyst to break free..." This referred to Gregory Russoff's first transformation into a werewolf and him releasing the werewolf curse within himself and future generations, a curse that had been in his family already for generations. It is obvious, but looking back at this now knowing about Vârcolac, this can now retroactively be seen as a reference to the wolf demon. Gregory didn't just turn into a werewolf, but a feral werewolf under the demon's control. The Darkhold, the book Gregory read from, was after all written by Vârcolac's dad Chthon. Marvel Spotlight I#2 is the first appearance of feral werewolf Gregory and his first transformation. The storyline that ran from Marvel Comics Presents I#54-59 (1990) served to make Werewolf (Jack Russell) a more heroic character because even in werewolf form he now possessed his human intellect and was under control. Indirectly this was also the first time he wasn't acting feral, which means Värcolac's control over him was temporarily broken through this storyline. Back-up stories in Doctor Strange: Sorcerer Supreme#26-27 (February-March, 1991) connected the origins of werewolves to the Caretakers of Arcturus. Marvel Comics Presents I#55 connected werewolves origins to the Elder Gods. 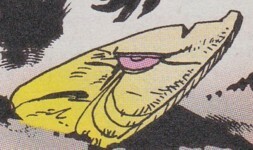 Marvel Tarot connected them to the wolf demon Vârcolac. The handbooks combined this info in a clever way. Vârcolac is Romanian for werewolf. This domain was the place where the souls of dead werewolves went only to be tormented by the Wolf Demon for eternity. Trapped in this realm their remains were all over the place. Vârcolac was omnipontent in his realm and could form a physical form from the souls of the deceased werewolves. Though the domain was invaded numerous times over the centuries by individuals seeking the last puzzle piece to overthrow the Wolf Demon or gain control over the lycanthropic curse none except Jack Russell were ever able to leave the realm again. The hellish landscape was comprised of a rocky ground with werewolf skeletons strayed all over the place. Some of them impaled by spears or hung on trees. Those few still not completely decomposed were trapped in the surroundings until the last pieces of flesh were gone and stayed sentient for a long, long time (it seemed like an eternity). (Werewolf by Night II#1 (fb) ) - During the Middle Ages the wolf-worshipping Cult of the Third Moon chanced upon the Wolfsblade and tried to use it to gain control over Vârcolac, but instead they became indebted to the demon because it was just one part of the puzzle needed to control him. Since then the cult performed countless human sacrifices with the Wolfsblade to their demon master. During the 1930s silent movie actor Walter Clarke purchased the Wolfsblade, which became a centerpiece in many of his parties. The knife remained in his possession. (Werewolf by Night II#2 (fb) - BTS) - As owner of the Wolfsblade Clarke became the new leader of the Cult of the Third Moon. The cult continued to sacrifice humans with the Wolfsblade to Vârcolac. (Werewolf by Night II#1) - Jack Russell did some research and found out about the Wolfsblade's existence. (Werewolf by Night II#2) - The Cult of the Third Moon performed another human sacrifice with the Wolfsblade, but were interrupted by Werewolf (Jack Russell). During Werewolf's attack on them the elderly Walter Clarke crawled to the Wolfsblade, which had been dropped by the cultist performing the sacrifice, but Werewolf reached Clarke before the former actor reached the Wolfsblade. With only moments to live Clarke told Werewolf that the Wolfsblade was only one of three pieces needed to overthrow the demon controlling werewolves. (Werewolf by Night II#2 - BTS) - Jack took the Wolfsblade with him and ran into the mysterious Smedley, who led him to a Ghost Train ride at a funfair, which led to Vârcolac's portion of Hell. (Werewolf by Night II#3) - Jack pulled the Wolfsblade out of his satchel before ripping the "Magic Bullet" from the Ghost Train car. Putting both in his satchel he continued his way to the demon's domain. (Werewolf by Night II#4) - In Vârcolac's domain Jack pulled the Wolfsblade from his satchel and realized that the knife handle could be removed from the blade and that only the blade was part of the puzzle. Vârcolac, posing as a boy with the wooden box in hand, approached Jack and complimented him on finding out the Wolfsblade's secret. Jack absorbed the complete puzzle into after overcoming the demon. It embedded itself into his chest and on Earth looked like a tattoo. 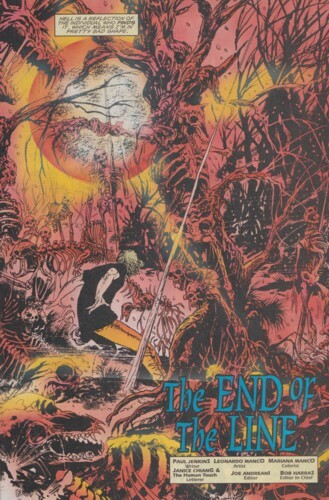 (Werewolf by Night II#3) - After going through a delusion on a Ghost Train ride at the border to Vârcolac's Hell Jack pulled the "Magic Bullet", the second part of the puzzle needed to overthrow Vârcolac, from the train car and pulled it into his satchel before continuing his voyage to the demon's domain. (Werewolf by Night II#4) - In Vârcolac's domain Jack pulled the "Magic Bullet" from his satchel. (Werewolf by Night II#4 (fb) ) - Centuries ago Vârcolac put the last puzzle piece to overthrow him into a wooden box placed on a pedestal in his portion of Hell. (Werewolf by Night II#4 (fb) - BTS) - Many have tried to acquire the puzzle piece, but none succeeded and instead got trapped in the demon's domain. 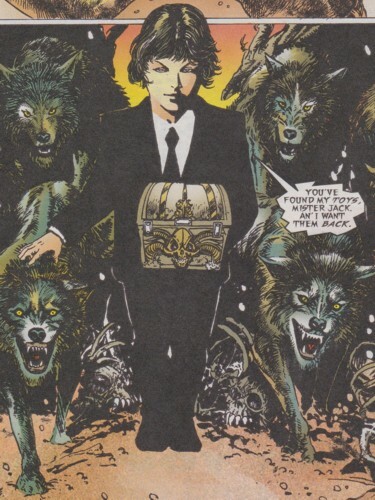 (Werewolf by Night II#4) - Posing as a young boy Vârcolac approached Jack Russell with the wooden box in hand. He placed the box on a pedestal and told him that if he wanted it enough he could take what was inside the box. Jack eventually opened the box by tossing a wooden stick against it. Picking up the "Wolfseye" Jack was now in possession of all three puzzle pieces.